We’ve explored the best and worst of Super Bowl entertainment before so I’ll cut right to the chase on this one. The Madonna Super Bowl halfttime show left me wanting a whole lot more. And, unfortunately, the best part about it was watching that guy bounce around on that crazy tightrope thingy. Sure, many fans thought it was a great show, but, unfortunately there was much more that we could’ve experienced together. As the drama built up during the 3rd and 4th quarter, I realized the halftime show should have been as exciting and thrilling as the game was. And that is why halftime shows are usually subpar. The performance isn’t like a normal concert where the artist is getting a traditional transactional reward for performing. So essentially what we’re watching during the halftime show are really commercials masquerading as concerts instead of actual performances where the artists are getting paid to put on great show. So if an artist is doing the show for free when they’re use to getting paid, does that set the stage for a phoned in performance? Probably. And let’s face another truth, 12 minutes is not the ideal amount of time to allow anyone to put on a decent show. So if we’re talking about a 12 minute window of “free time” to do pretty much anything, I think the halftime show should be way more experimental that it is. And we shouldn’t treat the halftime show like it’s a normal concert environment because it’s not. So as I watched the Giants players plant kisses on the shimmering Lombardi Trophy, I was convinced we as live music fans are ready to experience the next evolution of the Super Bowl halftime show. We’re ready to engage in more meaningful experimentation and not just a second rate record hodgepodge record release party, which is pretty much what Madonna, LMFAO, M.I.A. and the NFL gave us. That said, I believe if the fans, bands and brands truly embrace this “free” business model it could help innovate the halftime show. And what we discover during this experimentation could inspire innovation in other areas of the live music industry. To get us rolling, here are a few suggestions of how we can make the halftime show more of moment of live music experimentation that pushes boundaries, or at the very least create a moment where we can discover something new instead of repeating the same disjointed and underwhelming blah that was served up on Sunday for 12 minutes in Indianapolis. 1. We’re Ready To Go Virtual. As a culture of concert fans who are perpetually hungry to head into the future, we’re more than ready to experience a totally virtual halftime show, and I think we need to mash up the media next time around. And one way we could do it next year is have Japanese virtual star Hatsume Miku and the creepy, albeit funny, etrade baby dual host the show and take us on a new bizarre journey that makes us laugh and celebrates our ever-growing love for living in a increasingly digital world. The etrade baby could emcee and Miku could rock the stage. Think I’m crazy? Trust me. Just close your eyes and imagine it. It could happen. And let’s face the truth. When real artists can’t entertain us like they should, we need to think about handing the ball off to virtual artists to see what happens. Heck, we could even hurl a Hail Mary to the entertainment endzone to see if a team of costumed character and puppets like Yo Gabba Gabba can score a stadium-rocking touchdown. This is free entertainment after all. 2. Have One Worldwide Google Plus Hangout. I’m surprised that Google didn’t use the BIG GAME as a platform to showcase the awesomeness of the Hangout. Like Daria Musk and other artist (not Madonna by the way) and fans are doing, the Halftime show could’ve been a worldwide festival of concert fan coming together to celebrate live music as one big family on one of the biggest stages in history. Fans are the heart and soul of the live music experience and instead retro-celebrating the greatest hits for free, we should turn the spotlight on the fans and celebrate not only the present moment, but also the future of how fans will experience live music as social media continues to become a natural thread woven into the fabric of our lives. Google should jump on this Hangout idea and get to work to see what they can do. They have 364 days to test and see how they successfully innovate and redefine the Halftime show and pull off the world biggest Hangout. Google is a company that knows better than anyone how to deliver free products while creating value for sponsors, artists and fans. So why not let them have a crack at redefining the halftime freemium business model? 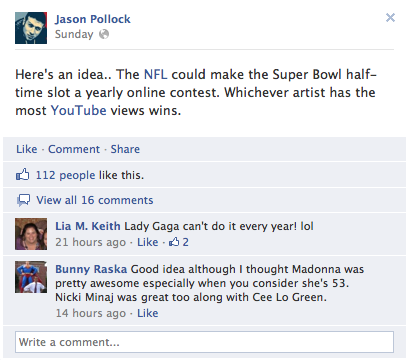 I saw this third suggestion come through my Facebook stream via Jason Pollock who proposed the idea of hosting a YouTube contest to let the fans pick their favorite artist and then let that artist perform during the Halftime show. And since Google owns YouTube, I think you could combine this YouTube idea with the Hangout idea and have a halftime show where fans are more engaged than ever. Speaking of engagement, and according to Mashable, the Madonna halftime show earned a record-setting 10,245 tweets per second. That’s great and we already know that fans love to tweet during the live music experience. But just imagine what would happen if fans were not only tweeting about the halftime show but having Hangouts and sending ripples of real-time conversations about their experience across the web in one collective and measurable surge. For starters, the engagement levels could be pretty sweet on all levels: Fans connect with fans, the artist connect with fans, and everyone has an amazing experience in the process. And as an added bonus for brands who would sponsor such a halftime show, they too could benefit from the buzz as their brand gets associated with this memorable emotionally-charged moment while audiences enjoy a new way to celebrate live music by connecting with each other and interacting with their favorite artist. Will All This Be A Reality Next Year? I hope at least some of this stuff happens because I can’t take another underwhelming halftime show again. And again, I believe that using social media to rethinking this “free” model presents so many more opportunities to elevate the halftime experience for everyone, whether you’re at the game or glued to all your screens at home. So let’s get our collective creative juices flowing and see what we can come up with. What do you think about the free Super Bowl halftime show? How would you use the 12 minutes of share your experiences and ideas in the comments below, on Twitter @livefixmedia, on Facebook, Google Plus, or call the concert fan hotline at 773-609-4341, and we’ll include them in a future episode of Live Fix Radio. What Happens When You Mix Live Music, Community Management and Social Business? i love it … great and excellent stuff man..
Well, the post is actually the freshest on this worthy topic. I fit in with your conclusions and will eagerly look forward to your incoming updates. Saying thanks will not just be sufficient, for the tremendous clarity in your writing.